Okay, so my dog Barclay jumped off my second story balcony while I was making dinner tonight. He is okay, but the fall definitely upstaged the excitement of making Brunch Eggs Ranchero from my 1960s cookbook. I did manage to take some pictures, which I will upload later when I feel less lazy. Thus begins my first night of Mad-Men-inspired-retro-cookery. All in all this was a good meal, and very cheap. I had eggs and bacon on hand (bacon freezes well) and the can of Rotel tomatoes was only $1 at the store. Betty Draper would disapprove of the convenience of canned tomatoes, but as a working woman I have to cut corners where I can. 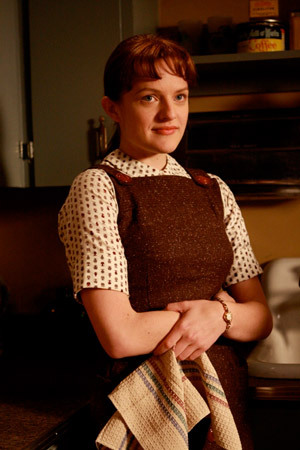 I am sure Peggy Olson could relate. Preheat oven to 325. Cook the bacon in a medium skillet over medium heat. Drain fat and blot cooked bacon on a paper towel. Drain the can of tomatoes, then pour tomatoes into the skillet to heat through. Add bacon to tomatoes. Once everything’s hot, spoon the mixture into individual-sized casserole dishes or oven-proof bowls. Gently slip one egg on top of each dish, sprinkle with salt and pepper, then bake for 15-20 minutes. I like my eggs runny, and 2o minutes was too long. Serve immediately with toast or tortillas. Drink suggestion: bloody mary, screwdriver, greyhound. This entry was posted in Breakfast, Includes Meat, Recipes and tagged Bacon, Eggs, peppers, Tomatoes. Bookmark the permalink.